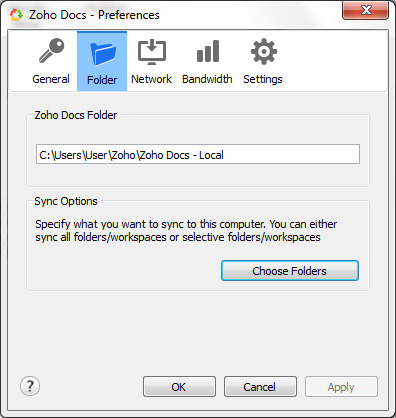 How to download the Zoho Docs app and sync files to your desktop? 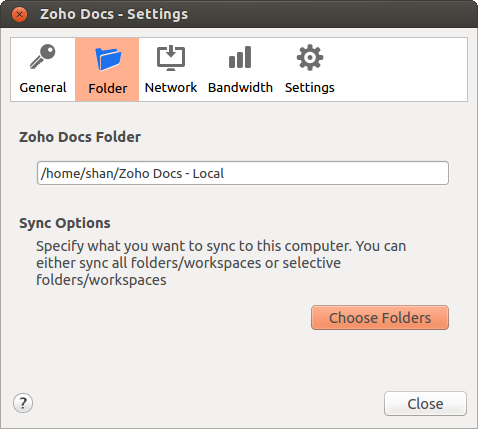 Zoho Docs for your desktop lets you to sync your files in Zoho Docs to your computer and vice versa. 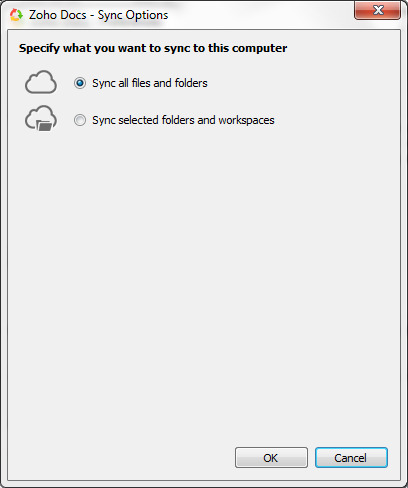 The syncing is instantaneous, meaning, the syncing happens whenever you modify or add a new file or a folder either in Zoho Docs or in your computer. This helps you to work on your files offline, which gets updated to your Zoho Docs as soon as you go online. You can even sync your files to multiple computers using the same Zoho Docs account, which enables you to work from any of your computer, be it your office or a home computer. Double-click to execute the EXE and follow the instructions to complete the installation. 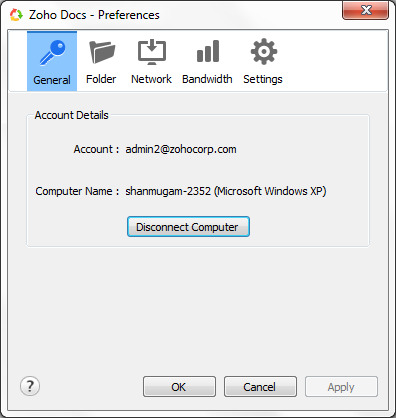 Double click on the Zoho Docs Installer file to complete the installation. Note: If you are connected to the internet via a proxy server, you will see an error as "Could not connect to Server" with a link to configure Proxy Server. 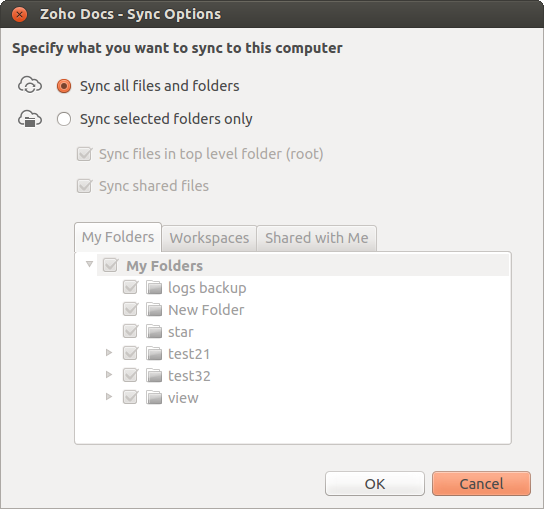 The default option is to sync all the folders in your Zoho Docs account. You can choose to sync only the selected folders from your account. 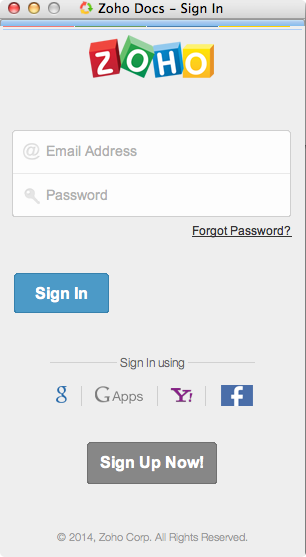 Select the required option and click OK. Click Next to see the summary of your setup. Click Finish to complete the setup and to start syncing. 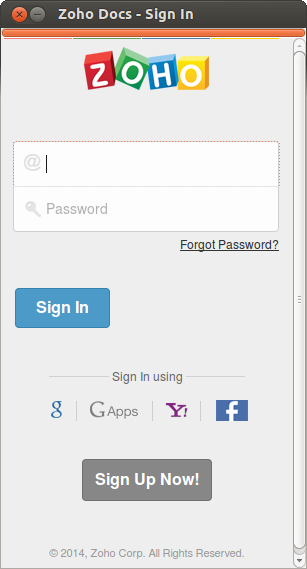 You can verify the status of the sync from the Zoho Docs icon available in your menu barsystem traysystem tray. 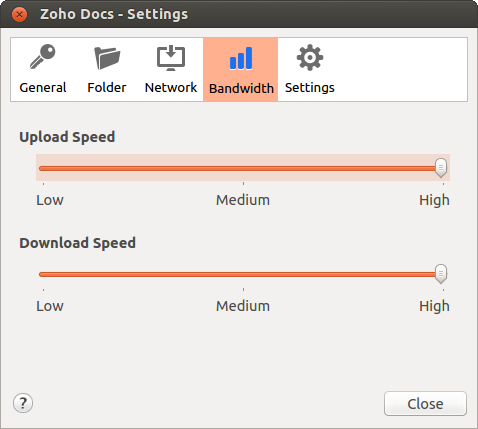 If the computer do not have a direct internet connection, you can specify how Zoho Docs should reach the internet. 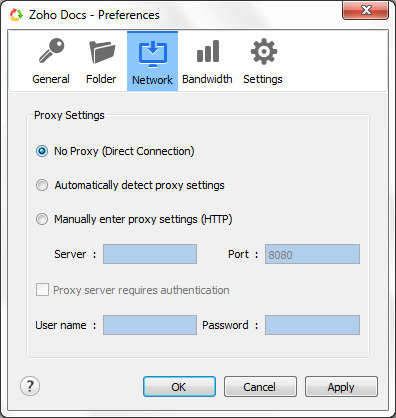 You can get into this screen by either clicking the Configure Proxy link on your login screen or by choosing the Settings option by right-clicking the Zoho Docs icon from your menu barsystem traysystem tray. 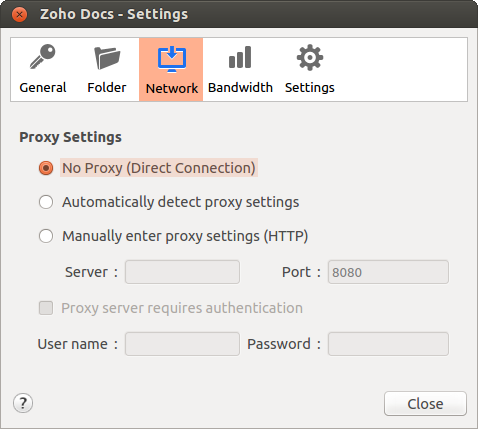 Specify the details of the Proxy server and the authentication details, if required, and click OK.
Zoho Docs lets the users set the bandwidth limit for upload and download. 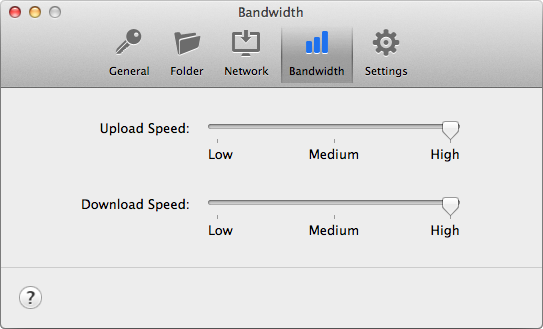 While the default is set at "Low" for both upload and download, the users can change as per their requirement. By default, Zoho Docs will sync all the files from your Zoho Docs account to your computer. If you have missed to choose the folders during the initial setup or if you wish to change the setting at a later point, you can do by choosing the Settings right-click menu from the Zoho Docs icon in the menu barsystem traysystem tray. 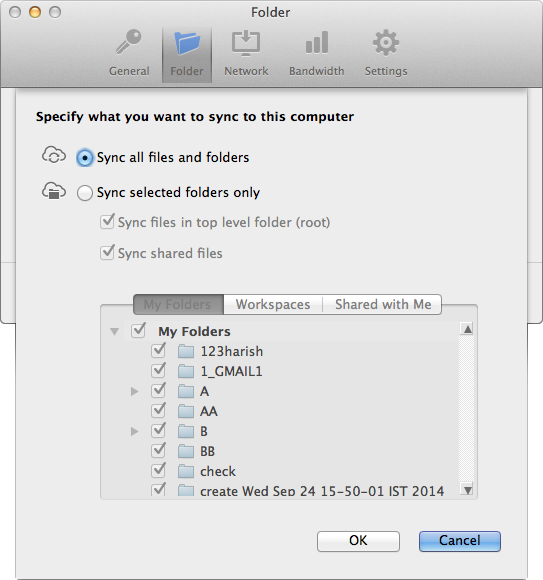 Choose the Folders that you would need to sync and click OK. 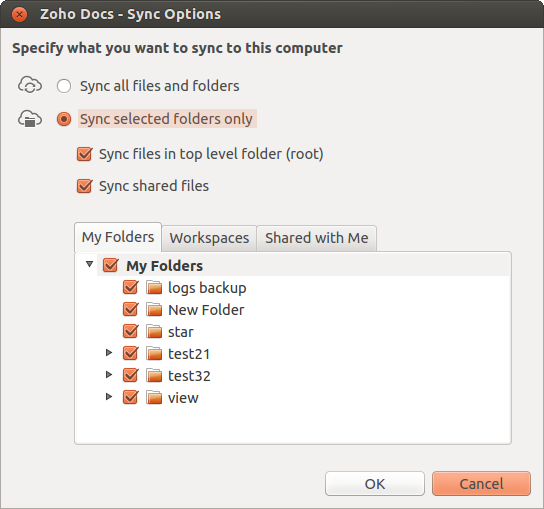 Note: If you have already synced all folders initially and if you choose to remove few folders now, those folders and files will automatically get deleted from your computer, provided the file versions on computer and your Zoho Docs are the same. Editing files within read-only folders. Renaming, moving, or deleting a read-only folder or the files within it. Adding or creating files in a read-only folder. If you happen to perform these actions unknowingly on a read-only folder synced to your desktop, you'll get error messages reminding you of your permissions. For example, if you try to edit a file within a read-only folder, an error will tell you that the file is locked or that you don't have permission to edit the file. 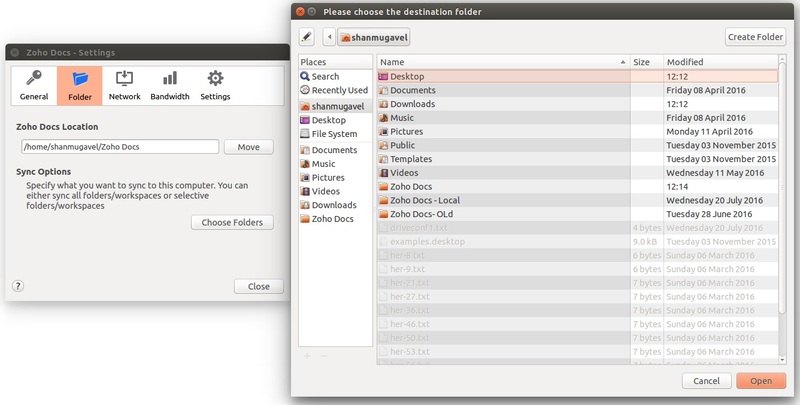 Similarly, trying to delete, move, rename, or add files may trigger an error if you do not have the proper permissions. The system reaction to this error will differ depending on your operating system. Error restricting the user from editing a read-only file. The Move to Trash option is absent in the dropdown menu. The options Cut, Move to, and Rename are disabled. 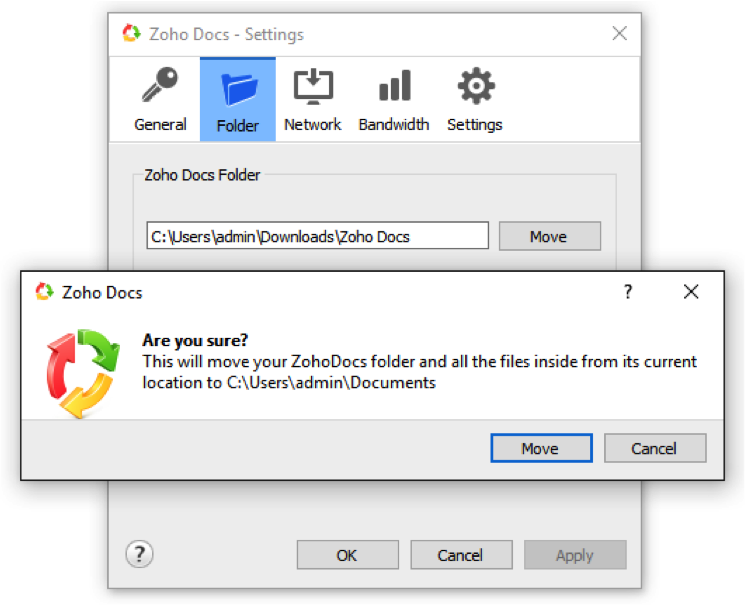 Having the flexibility to move your Zoho Docs folder can be helpful in a number of situations: when re-allocating disk space on a Windows/Linux machine; when re-installing your OS or reformatting a particular drive; or when you want to have all your Zoho Docs files under a specific folder on your desktop for easy access. Always move the folder from the application settings window. 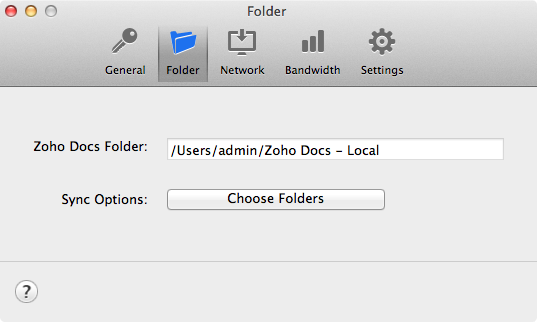 Dragging and dropping the folder manually will break the link between your desktop and Zoho Docs. Never move the folder to an external hard drive or network drive, as that will prevent Zoho Docs from accessing or syncing your files. Click the Sync icon on your desktop. 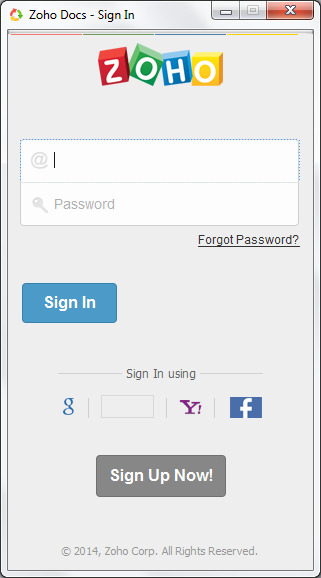 Select Preferences from the menu that appears. 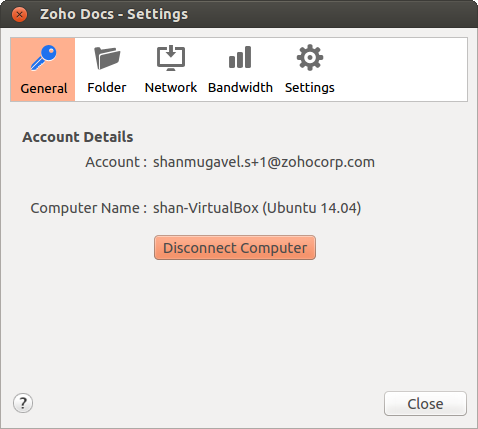 If you're using Windows or Linux, the current location of your Zoho Docs folder will be displayed. Click Move next to this field. Your local directory will appear. 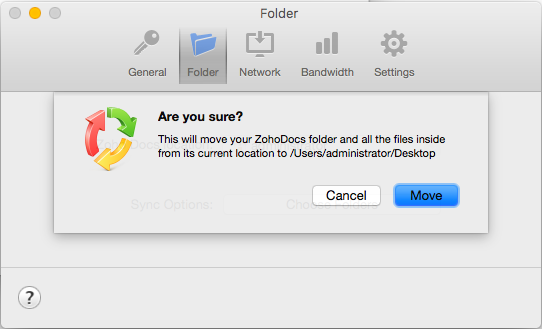 If you're using Mac, click the drop-down arrow next to Zoho Docs Location. Click Choose another location. Your local directory will appear. 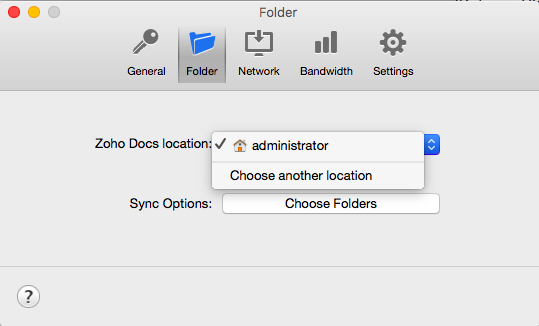 Choose the location you want to move your Zoho Docs folder to, and click Select Folder (in Windows) or Open (in Mac). A dialogue box will appear asking you for confirmation. Click Move to proceed. Once the folder has been moved, Zoho Docs will restart. 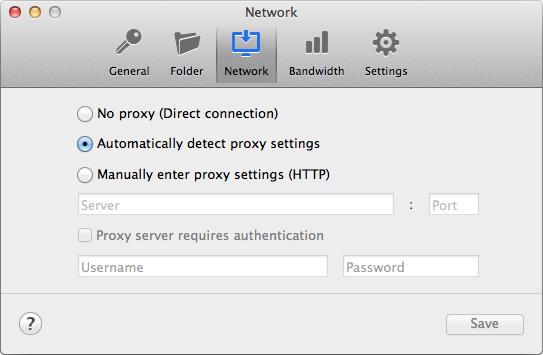 Follow the setup instructions to configure proxy settings and to choose the folders. The settings need not be the same in all the computers. 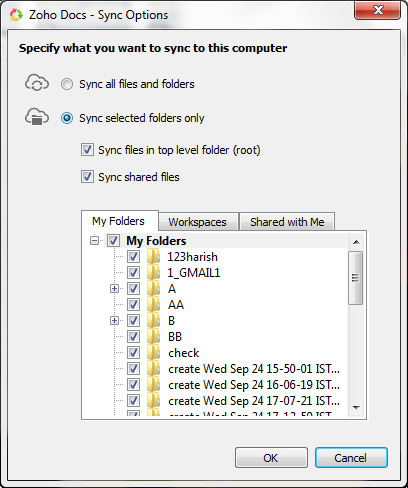 For example, you can choose to sync all the folders in one computer and only selected folders in another. When you no longer wish to sync your Zoho Docs and the computer, you can Disconnect that computer. 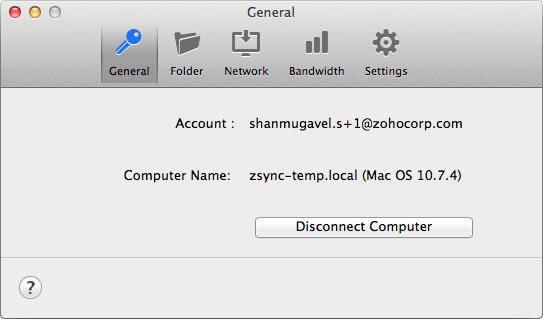 When you Disconnect a computer, the contents of your sync folder in that computer is not deleted, only the sync between that computer and Zoho Docs is stopped. Choose Settings from the right-click menu of Zoho Docs icon from the menu barsystem traysystem tray. 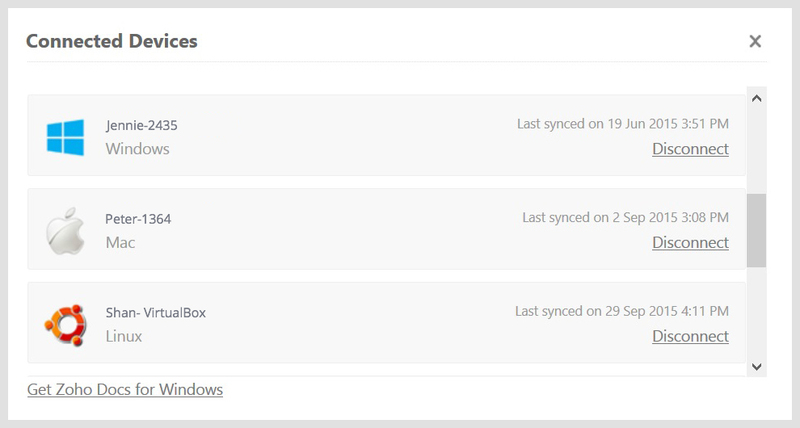 You can view all your linked devices and disconnect any of them right from your Zoho Docs page. 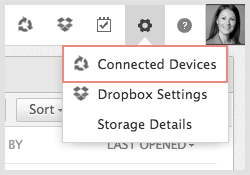 From the Settings icon in your Zoho Docs homepage select Connected Devices. All your connected devices will be listed here. Click Disconnect to unlink any device from your Zoho Docs account. You can uninstall any of your linked devices and add new ones in just few steps. Right-click the tray icon and click Preference>Disconnect computer.